Land Rover is well-known for its luxury SUVs, including the fancy yet rugged Range Rover as well as smaller and more affordable models like the LR4 and Evoque. 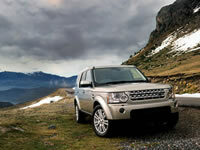 At its heart Land Rover is a rough and tumble vehicle despite its new reputation as an urban warrior, and one of just a few automotive brands in the U.S. to market solely SUV products. Keeping your Land Rover on a regular preventative maintenance schedule ensures it stays safe and reliable for you and your family through the long haul. Our multi-point inspections (included with any service) and honest approach to vehicle maintenance and repair see to it that your car is fixed correctly and at a fair price. Our Land Rover service and repair shop is equipped with state-of-the-art equipment and diagnostics to best service your car. Give us a call today at (253) 604-4128 or fill out our contact form online.